Beyond The Hills is as close as I have come to 'getting' the Romanian New Wave, though I am afraid that that is not saying much. At least though, unlike something as obliquely baffling as Police, Adjective - the narrative message of which requires that it be boring - Cristian Mungiu's film does have a semblance of drive to it, something committed pulling it along. That something seemed to me to be a clear look at what happens when Faith is forced on the faithless, or at least those who have other pursuits above God and religion. In Mungiu's world - a convent on the outskirts of a small Romanian town - the conflict between these competing ideas is boiled down to the internal dichotomy of Voichita (Cosmina Stratan), who has turned to religion because she has nothing else and the external 'push' of Alina (Cristina Flutur), who the convent attempt to convert, with disastrous results. In these two characters - who, it is hinted, may have shared a past love - Mungiu lays out a treatise oft-repeated the World over: religion, brought about unnaturally, can only lead to a conflict in one shape or another. 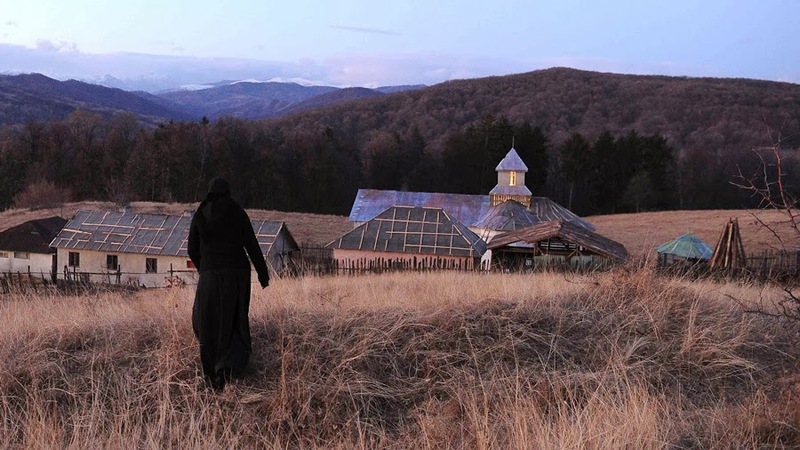 Voichita spends the film being torn between her duty to the convent and God and her repressed feelings towards Alina, whilst Alina spends it wanting to stay with Voichita but not wanting to conform and commit to the convent's rules and religion's social and spiritual instruction. It is, at times, an interesting and provoking (though not provocative) microcosm. The problem with Mungiu's film after this point is that his message emerges quite early, yet, like so much of Romania's new crop of films and film-makers, his narrative takes forever. Having set out his stall, Beyond The Hills dithers around, occasionally dipping into the idea of the girl's lost relationship (without ever establishing anything you care about) or hinting at ideas of devilish meddling (without ever crafting anything worthwhile, save one admittedly good scene, where the action happens in the background). Instead, Mungiu seems more interested in populating his film with the detritus of everyday life in the convent; chopping woodpiles and begging lifts off the local car owner. We see where the girls grew up, in a godless orphanage where you suspect some Bad Things happened, but it feels like it has been touched on, rather than examined in any depth. The void in plotting is occasionally filled by some hints that Mungiu is also interested in the modern world's encroachment on the traditional values of religion but, again, like a lot of the parts of his film unconcerned with the central battle, it feels almost half-hearted; a way to kill time at the final shot and in the sound of the occasional overhead helicopter, observing life from a distance and in that way, very similar to the viewer, kept a great height away from anything emotional, or that might inspire investment.